I really adore this story. I love that it is a story about war that children could appreciate and understand. The emotions behind living through both war and peace are clearly told. The illustrations are a perfect match for the story, as well. I think the "historical" origin of the tale gives it more weight and therefore, could be useful in a History or English class that deals with ideas surrounding historical truths, oral histories or how legands are formed. The peaceful message of the book is told in an extremely sweet and clever way - with the people stopping their fighting to laugh at the boy peeing. I would use this with students of a variety of grade levels to show a number of lessons - war and peace, the power of one person to change the course of history and the use of fact and fiction within the telling of history. I think this book would be a great way to prove that a complex topic can be viewed in a simple manner (through a children's story) - yet, still revel a powerful message. We discussed this book in my Children's Lit. class because it was challenged at one time or another since it has a naked boy in it. The illustrations are a lot of fun. 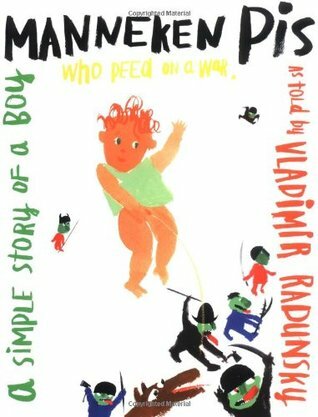 The story's based on a bronze statute in Belgium, the Manneken Pis, or "peeing boy" and how one day when the little boy's village was at war he stopped and peed on everyone and ended the war. It carries a great message for children about the absurdity of war. Normally I can't stand books that use potty humor, but I make an exception to this book. I need to read this book again with the kids and get past the humor of a boy peeing on everyone and instead talk about the war part and look up the statue, etc. This is a strange and dramatic tale about conflict and the humorous way one little boy found to end the fighting. It is loosely based on one or more of the many stories that surround the popular tourist attraction in Brussels, Belgium. I have seen the statue myself and thought this would be an entertaining story, but I made sure to show our girls the pictures of the real thing and read a little about the statue online (here, here, and here.) Our girls loved that he is dressed in various costumes throughout the year. I also showed them pictures of the other peeing statues located in Brussels, Jeanneke Pis, and Zinneke Pis. They thought the dog statue was very funny, especially when I told them that I initially thought it was a real dog when I first saw it on the streets in Brussels.The story in the book is very short and is accompanied by bright, splotchy illustrations. The illustrative style is very rudimentary and often blurry and I didn't really like them, but I understand how this book can boil down the horrors of war to a comprehensible tale for very young children. I thought it was interesting that the enemy is depicted as evil, scary monsters, and then as nice, friendly ones later on in the book. Overall, I liked the content of the story and the intent of the author to write about peace. I didn't like the illustrations, but we still enjoyed reading the book together and laughed at the picture of the funny little statue. I also thought it was interesting that Vladimir Radunsky wrote the following below the author's bio on the inside book jacket;"Other recommended reading on related subject for parents: Leo Tolstoy's War and Peace"
Con ilustraciones que parecen realizadas por niños pequeños que harían pis donde sea, este cuento narra en realidad o una leyenda o una crónica (requiero más rigor histórico para realizar esta reseña como Dios manda).Un niño que por hacer pipí en público haya detenido un guerra suena inverosímil, pero así es la historia y la vida a veces por lo tanto decido creerla y anoto en mi lista: visitar el mannneken pis en Bruselas. "Poor little boy, he was scared. He needed his mother and father.But more than that he needed ... to pee. He could not wait any more and ... he peed right there.Down onto the Booms and Bangs and Cling-Clangs he peed.He peed to the left,then to the right.Please forgive him. He was just a little boy." Someone (and I won't name names) ordered this for me as a joke. I finally read it. If you're looking for 5-minute read that's something a little different, you might want to try this strange little tale. I wish I could pee on the ridiculous war in Iraq and get the same results the boy did. I think it's neat that this is a true story but this book was a little too weird for me...and the illustrations are kind of headache-y. Hilarious and true story of the legend behind the peeing-boy statue. A simple story about the futility of war, and based off a real statue in Brussels, Belgium. Apparently it's a true story. The story of the legendary Belgian boy who made his own simple but brilliant protest against war. Vladimir Radunsky - Born in the Ural Mountains of Russia, Vladimir Radunsky migrated to the United States in 1982, when he was still a relatively young man. Since then he has become well known for his brightly colored artwork and dynamic collages. Among the many children's books he has illustrated are the Candlewick Press titles HOWDI DO, BLING BLANG, and MY DOLLY, in which his vibrant images bring to life the nursery songs of folk-singing legend Woody Guthrie--tunes that appealed to him because they reminded him of songs he loved as a child growing up in Russia.In collaboration with fellow illustrator Chris Raschka, Vladimir Radunsky wrote and illustrated a rather unique collection of tongue-in-cheek advice on a very important topic: TABLE MANNERS. Through their alter egos Dudunya (Vladimir) and Chester (Chris), the pair share their considerable wisdom in a how-to guide to mealtime behavior. The artist moved on to explore the world of shapes in SQUARE TRIANGLE ROUND SKINNY, a boxed set of fun, funky board books featuring his brilliant graphics. "I don't pick the medium I work in, but rather it just happens," he says. "And most of the elements I use are repeated in various combinations. Recently I came across a story by Hans Christian Andersen. In it, I found this thought that pretty closely resembles my work principle: 'Ah, godfather could really tell fairy tales--they were long and plentiful. And at Christmastime he would take a thick, blank album and paste in it pictures that he cut out of books and newspapers. When he could not find a picture that fitted the story, he would draw one.'" Vladimir Radunsky now lives in Rome, Italy.